Through Living Free, you church or ministry can unleash a fresh wave of small group leaders. 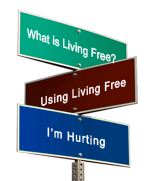 A Coordinator's Guide and a Participant's Guide have been designed so that you will receive maximum benefit from the Living Free video-based training. Understand life-controlling issues -- how they develop and the impact they have on individuals and families. Prevent life-controlling problems or deal with them in your own life. Help others with life-controlling issues. If you decide to become a facilitator of a Turning Point small group, this training will help equip you to lead a small group effectively. Establish an ongoing Turning Point Ministry. Two DVDs with ten hours of teaching synchronized to a workbook. One Coordinator's Guide with step-by-step instructions for leading the training process. One Participant's Guide designed to guide individuals through the training experience with content summaries, group interaction, and additional helpful resources.